This was the seventh and concluding in a summit series which started in January in Senegal (West Africa) and has been held in various regions of the world throughout the year. H.E. Syed Yusuf Raza Gilani, former prime minister of the Islamic Republic of Pakistan. Dr. Hak Ja Han Moon, co-founder of UPF and sponsor of the summit, attended. Other high-level delegates consisted of five current first ladies, 10 former heads of state and government, one current deputy prime minister, seven government ministers, and five current speakers of parliament and national assemblies. Representatives of various governments, parliaments, civil society, the private sector as well as the International Conference of Asian Political Parties (ICAPP) and the International Association of Parliamentarians for Peace (IAPP) were also in attendance and contributed to the success of the Summit. 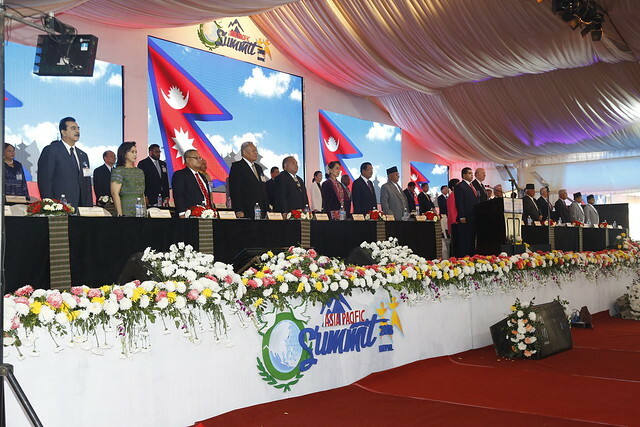 Nepal was selected as the Summit venue to highlight the successfully concluded peace process and the promulgation of the new constitution through the people-elected Constituent Assembly. Nepal’s success is a unique example of peaceful and democratic transformation. It is a telling testimony that dialogue triumphs over differences, and the ballot over the bullet. What Nepal has achieved in conflict resolution and peace transformation can be an inspiring success story for many people longing for peace in different parts of the world. Other areas of innovation and models for peace-building found in Nepal comprise: cooperation between government and civil society, the integrity of inter-generational family ties, and efforts to raise awareness of the effects of climate change. The Summit highlighted these paradigms of peace during various sessions. The Asia Pacific Summit concluded with a special declaration on climate change as well as the Kathmandu Declaration related to peace and development. Also, the International Mayors’ Association for Peace (IMAP) was launched. The Kathmandu Declaration drafting committee consisted of a think-tank and diplomats from Nepal, India, the People’s Republic of China, Australia, Thailand, the Philippines and the United States. The Asia Pacific Summit invitation committee included, in part, the former prime minister, Hon. Madhav Kumar Nepal, chair of the committee and senior leader of the Nepal Communist Party; the chairman of UPF, Dr. Thomas G. Walsh; and the former speaker of the Philippine House of Representatives and founding chairman of the International Conference of Asian Political Parties, H.E. Jose De Venecia, Jr.; Dr. Chung-sik Yong, president of UPF-Asia Pacific; Hon. Ek Nath Dhakal, two-time minister of the government of Nepal and chair of the International Association of Parliamentarians for Peace for the Asia Pacific region, and other prominent figures. To read the Kathmandu Declaration on Peace and Development, click here. To read the Kathmandu Declaration on Climate Change, click here. To read the IMAP Declaration, click here.